The Fire Sculpture I created for, and fired at, this year’s Vernal Equinox proved to be the most successful sculpture to date. It has now become an annual event for family, friends and my fellow tree or spring guardians. 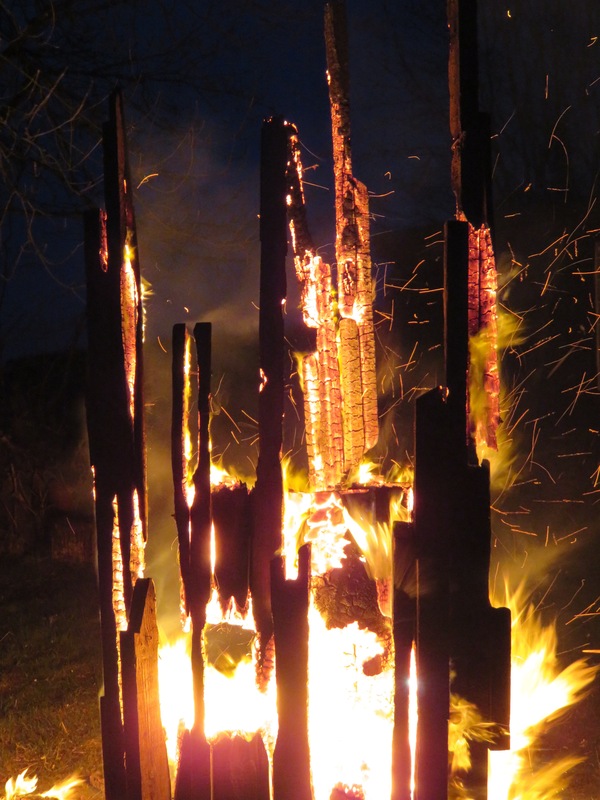 Using gash timber from our old hay store I created a three sided structure with a raised pinnacle which, as to order, disappeared inside once the fire developed a life of its own and roared away. Just before everyone arrived a large white goose waddled down the lane and walked into the orchard. All the guests were greeted by a honking goose. The goose stayed for a few days sleeping on one of the raised vegetable beds. The Vernal Equinox is a time of change so I encouraged my guests to bring an object, charm or totem to place on the sculpture so all the negative energy of the last year could be consumed by the fire. Since the arrival of the New Energy at the last Winter Solstice the trees have told me that we need to drop and ignore all the negative energy that surrounds us. We need to take a more positive path through a deep reconnection with the natural world.